One of the most common errors at times through the Summer months when there's been no fresh water and salmon are holding in the pools and not running is that most anglers fish far too big a fly & often too high in the water column. 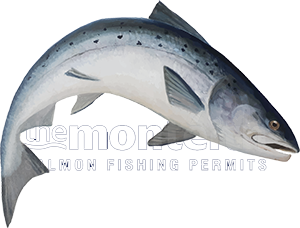 A salmon possesses an acute level of eyesight and to a degree most of us cannot fully appreciate. There's no different between the eyes of a juvenile salmon and that of an adult salmon so this is an important part of understanding Summer salmon fishing even though we all have a set idea of what a salmon fly should look like. In the low water of Summer you'll be shocked by just how small and subtle a fly can be fished to create the desired reaction from a salmon. To give you an exact idea of this imagine a little single or double of say a size 13 with only half a dozen short black wing fibres. This will look like a small trout fly with alopecia and will be difficult for you to see how this could possibly work until your line tightens. If a salmon partially sees the movement from a tiny fly it will often come to investigate with its mouth as opposed to seeing a bigger brighter less subtle fly which it will be familiar with as more and more appear each day in the pool it's holding in. Don't underestimate the attracting powers of these tiny patterns which should always be fished on a light leader. The other thought process that can make a big difference in gaining cooperation from a resident low water Summer salmon is to ignore the traditional full floating line approach and weight the front end of your fly line adequately to get your fly down onto the salmon's nose. This tactic will also often gain the desired reaction from a salmon. These are just two basic factors for consideration that will often allow you to 'pull the rabbit out of the hat' when faced with older more 'educated' salmon during the low and warm water conditions of Summer. When you gain faith in the tiny salmon fly Summer approach it will no doubt make you realise just how many opportunities you've probably missed in the past by fishing far too big a fly.